(2018) Continental Philosophy Review 51 (3). Peter Goldie's account of grief as a narrative process that unfolds over time allow us to address the structure of self-understanding in the experience of loss. Taking up the Goldie's idea that narrativity plays a crucial role in grief, I will argue that the experience of desynchronization and an altered relation to language disrupt even of our ability to compose narratives and to think narratively. Further, I will argue that Goldie's account of grief as a narratively structured process focus on the process having come to an end. By contrast, I will propose the idea that grief can be understood as an open-ended rehearsal of our capacity to be alone in the company of an absent other. This makes grief a relational activity that differs from composing narratives about one's past and about one's process of grieving. Thus, grief is not primarily a process of recollecting our past narratively; rather, it can be seen as a dedicational activity which involves a future-oriented and open-ended rehearsal of relatedness despite irrevocable absence. Ryberg Ingerslev, L. (2018). Ongoing: on grief's open-ended rehearsal. 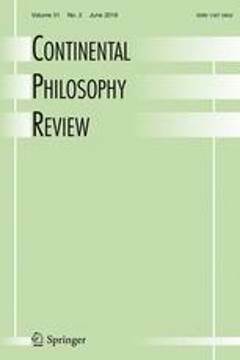 Continental Philosophy Review 51 (3), pp. 343-360.